Despite stiff opposition from his family, Sivakumar did not give up on his dream to develop an electronic jacquard loom. Anantapur-born Sivakumar Modha was just another degree holder in united Andhra Pradesh in 2000, all set to pursue his MCA at a private college in Hyderabad and seek a comfy software job that would keep his family financially sound and happy. Until a visit to a village named Modha, near his hometown Hindupur, where a significant population comprises the weaver community, changed the direction of his life. For someone who barely knew what a loom (maggam) was or what the significance of the jacquard loom in the context of textile designing meant, the experience wasn't only educative, but transformative too. The plight of the weavers who were suffering losses owing to the punch card system in the jacquard loom (that correspond to hooks that can be raised or lowered to design a saree) moved him. An impromptu thought of interspersing technology in place of the manual punch card system used for saree designing (which varies from design to design, one requires thousands of them to make a saree and their lifetime is barely three years) had struck his mind. If at all it's possible, the innovation could change our lives, many a weaver had nodded in response. "What was the use of higher studies or a luxurious life if I can't spur a change in the lives of the people? I'll work on something that'll change the face of this industry," Sivakumar had remarked. The decision wasn't met with favour among his near and dear ones and it took 14 years of his life and umpteen sacrifices to come up with an electronic jacquard machine (that he's tentatively titled Modha Tech). 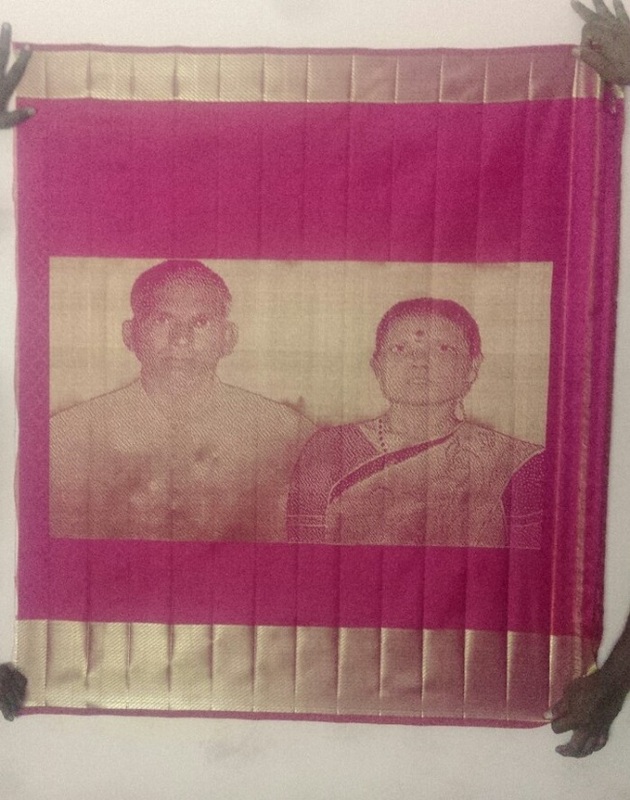 Sivakumar’s machine replaces the traditional punch card system with an image file comprising the textile design which when inserted in a pen-drive could be connected to the loom (through his machine). The digital twist to the original jacquard loom not only saves the time spent on saree designing by 90%, it nullifies any amount spent on the design through the punch cards, their transportation from town to town and also ensures great scope for designers to experiment with various patterns. “Of the 25 lakh looms in the country, over 19% of the looms are dependent on the punch-card designing system in making sarees. This electronic jacquard machine could trigger all the change the weavers need in their lives. I've designed it exclusively for handloom-based designing. This is a weaver-friendly machine also because I haven't made any changes to the external setup of the traditional machine but for the replacement of punch cards with the image file (pen-drive) based system. 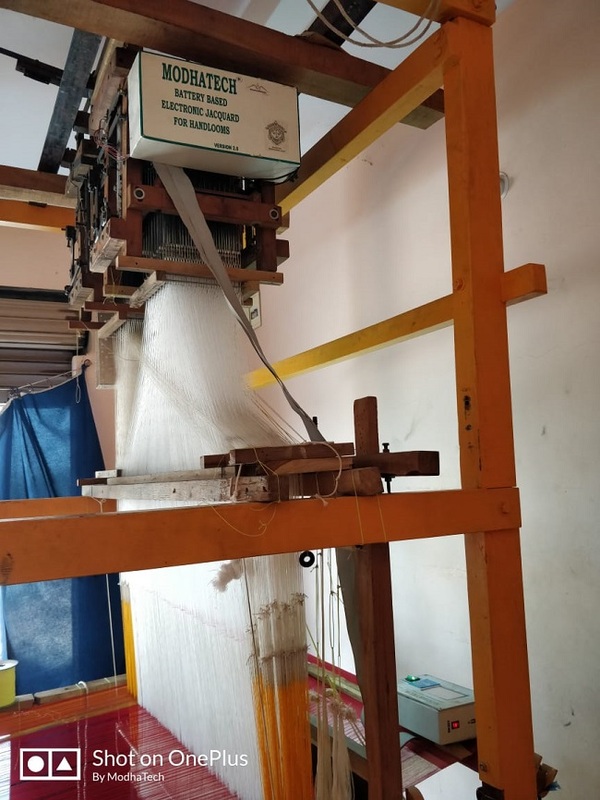 For all those who're used to working with the traditional jacquard loom, it'll be easier for the weavers to adapt to the electronic machine without any hassle,” says Sivakumar confidently. The complexities involved in making the machine didn't make him breathe easy all these years. For over two years, Sivakumar had spent 12 hours a day across several villages, understanding the intricacies of maggam designing and what was the need of the hour for the industry. As part of it, he had to do sufficient research on the hidden forces that kept causing damage to the jacquard machine's electronic component every few months. "Not many understood why a combination of a few forces disrupts the functioning of the machine for many years. Even though several scientists had known about this problem, not much progress was made to solve it. I wanted to come up with a solution that could increase the longevity of the electronic component. This is one of the key reasons it took me a decade and a half to come up with a machine that's also accompanied by a central unit (for which I had applied for a patent). The sole purpose of the unit is to absorb the hidden forces and ensure the smooth functioning of the machine's electronic components," he adds. It's the practical understanding of a weaver's life and his/her issues for over a decade that gave a definite edge to Sivakumar's innovation. The machine, besides being a boon from the designing perspective, is also battery operated. “Power cuts are a major roadblock to any weaver's life in the villages. That's a reason I've developed a power bank-like battery that can be charged completely and can function for two days without electricity,” he says. Two prototypes of Sivakumar's machine are functional at Hyderabad and the Aarni village in Tamil Nadu. Emotionally and financially, Sivakumar had to tolerate a lot of ups and downs all these years but he remained undeterred. Sivakumar's ties with his father were severed with his decision to do his bit for the weaver community. Soon, the latter expired and naysayers didn't have kind things to say to him. One fine day, Sivakumar left his native town and promised to return to his house only when his family could be proud of his innovation. He hasn't spoken to his mother and younger brother ever since, firmly investing all his energies in the machine he was manufacturing. When he got married, he and his wife decided to not have kids until his innovation makes a difference in society. "Everyone around me had tried to discourage me from coming up with a solution for the weavers. They questioned my capability to come up with a solution for the weavers when their community itself hasn't come up with any innovation that could transform their lives. I need to admit that I had received unexpected help from several quarters. Friends and social media acquaintances were instrumental in their contribution to my pursuits. I received help from strangers, including a China-native Jason Smith, a software engineer who'd donated Rs 25 lakh towards the research and development expenses that went into the machine. All along, my wife has been a rock who wouldn't give up on me, no matter what. I will make it up to my mom and brother someday. I only wish good for them," Sivakumar shares. Among the earliest of sarees he'd designed from his machine prototypes was one that had imprinted the image of his parents. 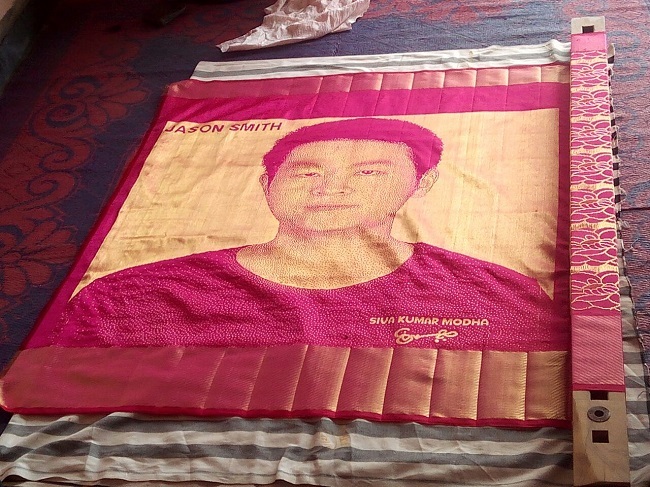 Another was a saree dedicated to his Chinese friend. He'd even got a Rs 20 crore offer from a Kolkata-based firm to sell his idea and machine to them. “I had straightaway refused the proposal. I haven't created this machine for my personal profits. It's for the betterment of the handloom weavers that prompted me to it,” he says. Incidentally, his life story shares a similar thread with that of Aler-based weaver Chintakindi Mallesham, who came up with an Asu-machine that simplified the weaving of the Pochampally sari to help his mother. “He's a source of motivation for me and his help in making me reach the right people and letting them know about my innovation has been immense,” Sivakumar says, with a sense of gratitude. Currently looking for investment opportunities to widen the reach of the machine to several quarters, he's hopeful that his efforts could attain fruition soon. “This machine would drastically reduce human effort, make this designing process easier for weavers of all age groups and revive their financial fortunes. This is something that has given me a purpose to life and continues to do so,” the 38-year old signs off.